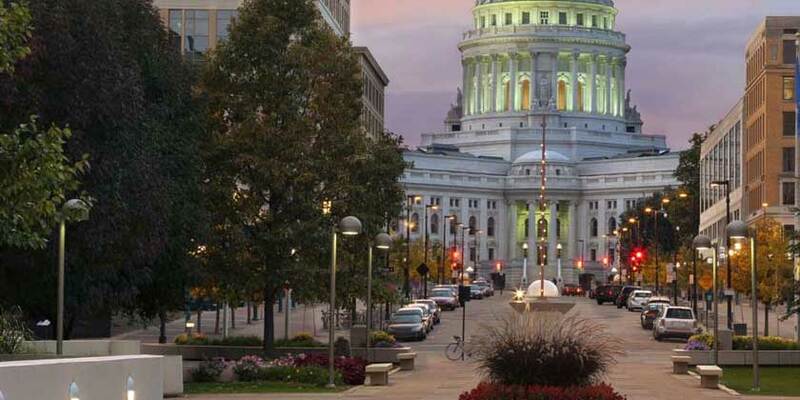 The quintessential college town, Madison, WI is home to the University of Wisconsin and the Badger State’s capitol. The city consistently ranks as one of the country’s best places to live. It offers visitors and residents alike plenty of opportunities for biking and canoeing along the shores of Lake Monona and Lake Mendota, which bracket the city. In the city center, the state capitol presides over an open-air farmers market each Saturday from spring through fall. Cheer on the UW Badgers at Camp Randall Stadium, or tour several architectural gems in the region designed by or inspired by Wisconsin native Frank Lloyd Wright.